A few years ago I had the pleasure of coaching my son’s basketball team. He was 5 years old and it was his first experience playing the game. 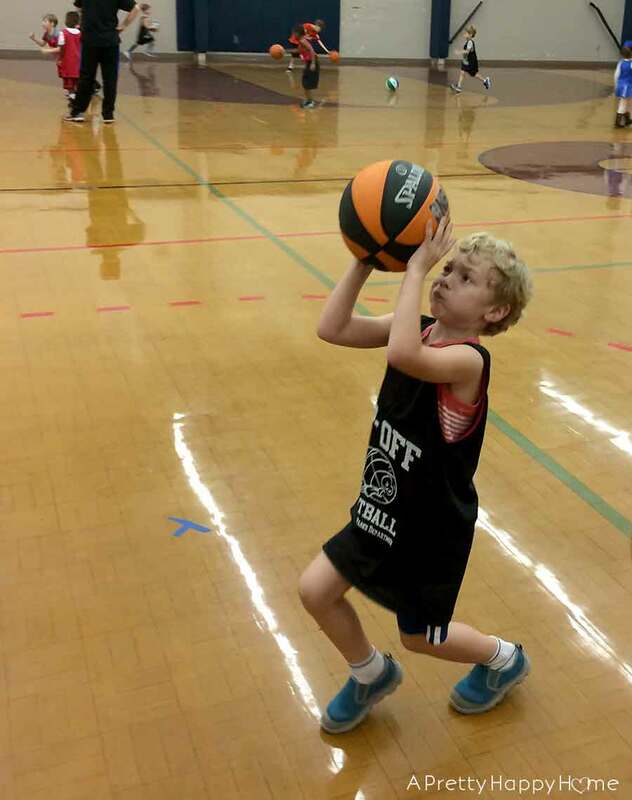 The stated goal of this particular basketball program was to introduce 4 – 6-year-olds to the game in a fun setting so they would want to continue to play the sport in subsequent years. I say this with all the affection of a mother. It was like coaching a pack of wild animals. Albeit, very cute wild animals. Let me tell you what you will (potentially) be up against. 1) 4 teams of 8 – 10 kids practicing on one basketball court. 2) 40 basketballs all bouncing at the same time on one basketball court. 3) The screams of 40 kids all yelling on one basketball court. Do you know how loud that all is? Very, very loud. Your team will not be able to hear you. Assuming they were trying to listen anyway. If you turn your back on the kids they won’t attack, but they might scatter – usually to go say ‘hi’ to their mom. Knowing where to start coaching this age group was a bit daunting because I wasn’t sure what they could handle. This was my first time coaching very young children. All my volunteer experience prior to that time was in coaching older elementary school-aged kids. Uh…that’s not exactly what a volunteer wants to hear. What did I get myself into? Ha! 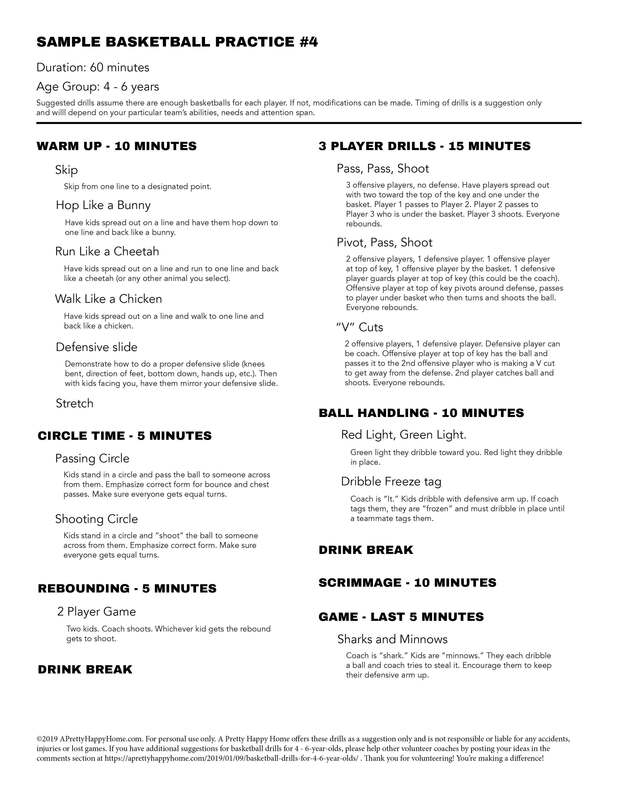 With some trial and error, I figured out what the kids could handle and how to organize the weekly practices to keep things fun and fast-paced while we worked on basketball and athletic basics. At the preschool and kindergarten age, kids are still developing their coordination. 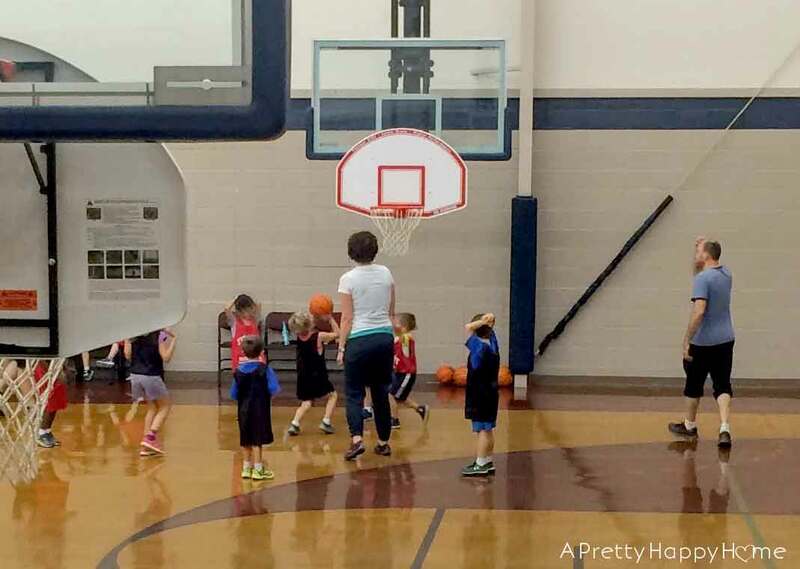 Some of them don’t even have the strength to get the youth-sized basketball up to the (lowered) basket. But they will! I focused on ball handling, passing/catching and shooting. 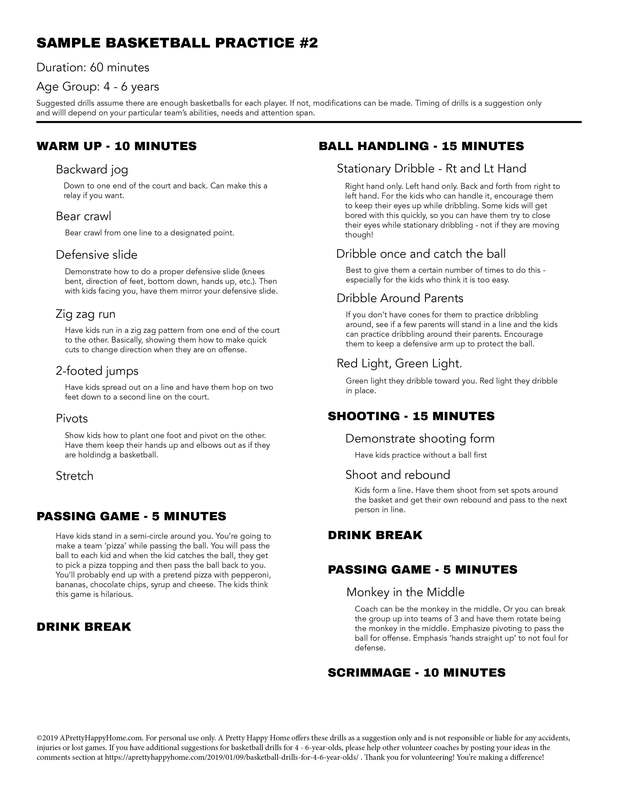 While the kids did play games in this basketball program, there was very little emphasis on rules and there was no score-keeping. However, I can definitively say I saw growth and development in each player’s abilities and confidence over the course of the season. 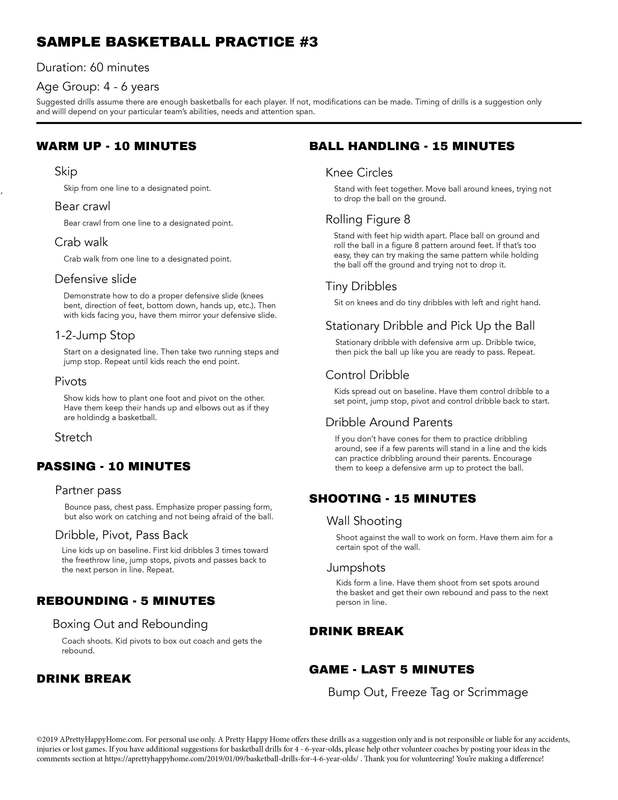 At the end of this post I am attaching free, printable PDFs of the basketball drills I used for a variety of 60-minute practices including the time spent on each drill. Feel free to print these out and use them at your practices. 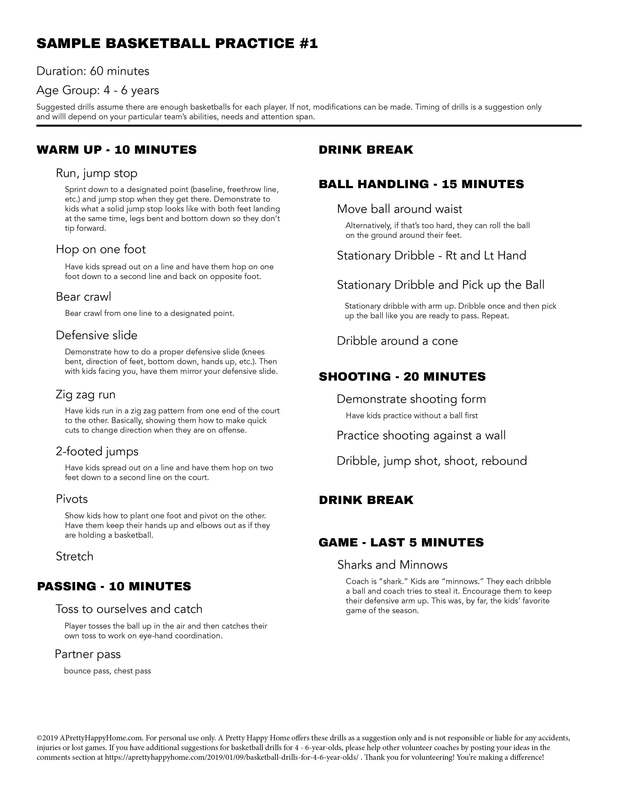 If you come up with some other combination of drills that work great for this age group, let me know and I can continue to update these PDFs or we will keep a running list in the comments section. Let’s help each other out! Here’s a sample of one of the practice outlines that I used. My originals were chicken scratch, so I typed them up for you. Now, all joking aside, coaching these young kids was incredibly rewarding and a great privilege. The kids light up when they see you. They tell you jokes and stories. They might bring you drawings. They are so excited when they score a basket. And even the smallest accomplishment is celebrated because, let’s face it, it IS a big darn deal! If you are reading this blog post then you are probably a volunteer coach or considering becoming a volunteer. As a parent, I want to thank you for stepping up and volunteering. Please remember this – you have a profound opportunity to make a positive difference in a child’s life. You don’t know if you will be the one adult that day who praised that child, gave them a high five or encouraged them. We take these small gestures of kindness for granted, but that’s not everyone’s reality. You can make a difference and those kids will be so happy you did.